In a stock sale, the seller gives the buyer shares. Once the buyer holds all the target shares, it controls the business by virtue of being its new owner. In an asset sale, the seller gives the buyer assets. Once the buyer holds all the assets, it controls the business by virtue of having everything that made the seller's equity worth something in the first place. So, even though the buyer doesn't have the seller's shares, it doesn't matter because the buyer has everything that made those shares worth something. The decision to structure a deal as a stock sale or an asset sale is usually a joint decision by the buyer and seller. For a variety of legal, accounting and tax reasons, some deals make more sense as stock deals while others make more sense as asset deals. Often, the buyer will prefer an asset sale while the seller will prefer a stock sale. The decision on which to go with becomes part of the negotiations: Often, the party that gets their way concedes a bit on the purchase price or on some other facet of the deal. When Microsoft acquired LinkedIn on June 13, 2016, what Microsoft was acquiring with its cash was LinkedIn stock. We know this because the announcement press release, merger agreement and merger proxy all describe how Microsoft is buying Linkedin shares. Both approaches conceptually get you to the same place, but certain legal, tax and accounting issues make this decision important. At the effective time of the merger, each outstanding share of Class A and Class B common stock (collectively referred to as "common stock") (other than shares held by (1) LinkedIn as treasury stock; (2) Microsoft, Merger Sub or their respective subsidiaries; and (3) LinkedIn stockholders who have properly and validly exercised and perfected their appraisal rights under Delaware law with respect to such shares) will be cancelled and automatically converted into the right to receive the per share merger consideration (which is $196.00 per share, without interest thereon and subject to applicable withholding taxes). Deal structured as a stock sale (what actually happened): Each shareholder gets $196, there are approximately 133 million shareholders, for a total value of $27.2 billion. LinkedIn shares are cancelled and cease to exist. Deal structured as an asset sale: Microsoft buys all of LNKD’s assets, including IP and intangible assets, and assumes all of LinkedIn’s liabilities for a total of $27.2 billion. LinkedIn (the company – not the shareholders) gets the $27.2 billion. LinkedIn (the company) issues a dividend to shareholders which amounts to $196 per share (assuming no taxes are paid at the corporate level on the gain on sale). The shares don’t get cancelled, but since after the dividend they are now shares in an empty corporate shell with no assets or liabilities, they are worthless and the company can be liquidated. NetApp (NASDAQ: NTAP) today announced that it has entered into a definitive agreement to purchase the Engenio® external storage systems business of LSI Corporation (NYSE: LSI) … in an all-cash transaction for $480 million. 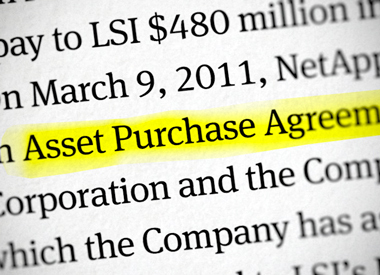 On March 9, 2011, NetApp … entered into an Asset Purchase Agreement … by and between LSI Corporation … and the Company pursuant to which the Company has agreed to acquire certain assets related to LSI’s Engenio external storage system business … as consideration for the Engenio Business, the Company will pay to LSI $480 million in cash and assume specified liabilities related to the Engenio Business. The contract in a stock sale is usually called (as it was in the LinkedIn deal) the Agreement and Plan of Merger or Stock Purchase Agreement. In an asset sale, the contract is called a Asset Purchase Agreement or Purchase and Sale Agreement. In addition to the considerations above, the other reason stock sales are more common is because the legal work of actually doing an asset sale is incredibly onerous (although there is a workaround for that called the 338h(10) election). Keep in mind that the buyer and seller preferences described above are broad generalizations. The extent to which the buyer and seller favor a particular legal structure depends on a variety of issues, including the tax environment, any tax attributes possessed by the seller, the seller's corporate structure and the extent to which the purchase price exceeds the book value of the assets being acquired. 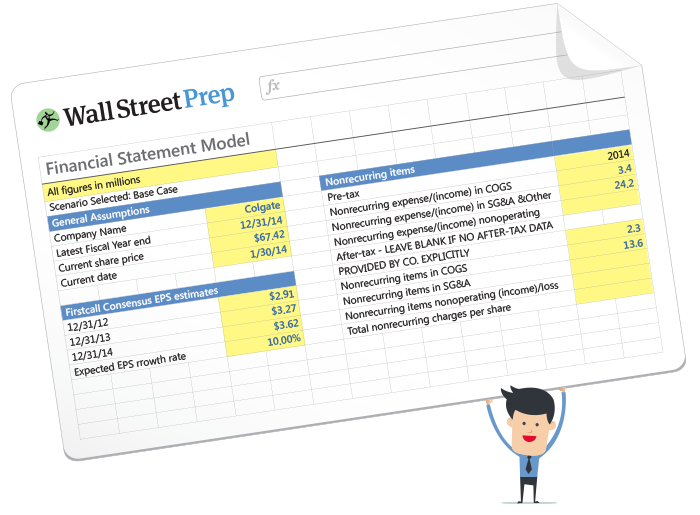 Click here to learn how to model and analyze the impact of stock vs asset sales on acquisitions.